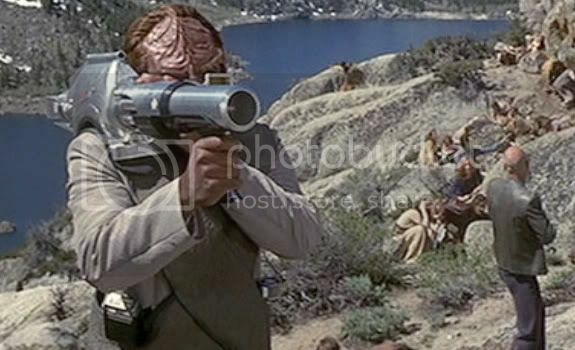 The Federation employs a wide variety of small arms ranging from the standard issue Type I phaser to heavy projectile weapons designed to operate in the worst possible conditions. This list is separated into two sections, the first lists weapons which all Federations vessels carry as a standard small arms compliment. The second section contains a list of weapons which are assigned on a mission specific basis, or are used in field combat. The Type I phaser is issued on away missions as well being carried while on duty. The Type I lacks the self charging system of the type two, and is only capable of firing a setting 8 beam capable of stunning most humanoid life forms, and killing smaller life forms only at close proximity. The Type I Phaser has no effect on any Cardassian Centurion Model. 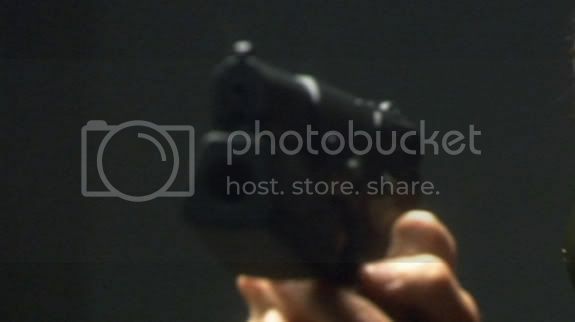 The Type II Phaser is the standard issue side arm through out the federation, and is the standard armament of most security teams and is used on the majority of away missions. The Type II Phaser has a wide variety of advantages over its smaller counterpart the Type I. The Type II Phaser can fire up to a level 16 discharge allowing it to cause minor damage to lightly armored positions as well as be used in demolition. The Type II phaser can also generate tremendous amounts of thermal energy allowing it to liquefy a target rather then destroy it. 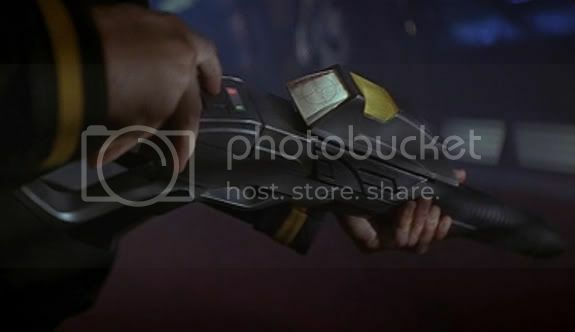 The Type II phaser employs an active recharge system, allowing energy from the phaser beam to be cycled back into the phasers energy system allowing it to maintain a near indefinite charge life. The Type II Phaser has no effect on any Cardassian Centurion Model. 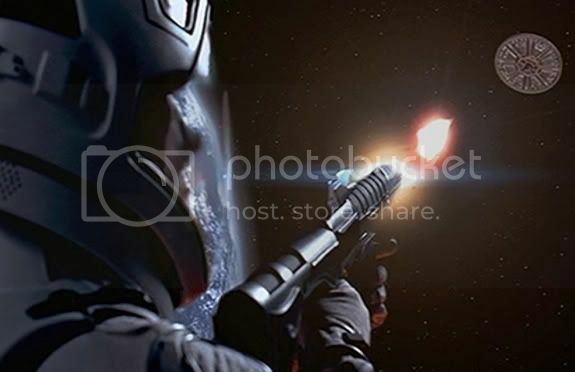 The Type III Phaser Rifle is carried by all star ships and is the standard rifle in use through out the federation. The Type III is more powerful then the type II and can penetrate lightly armored positions, and has proven lethal at long ranges. 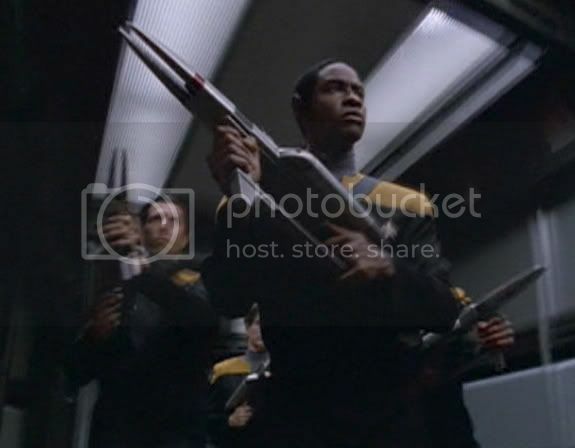 The Type III Phaser Rifle is issued to security teams as well as to landing parties in hostile situations. 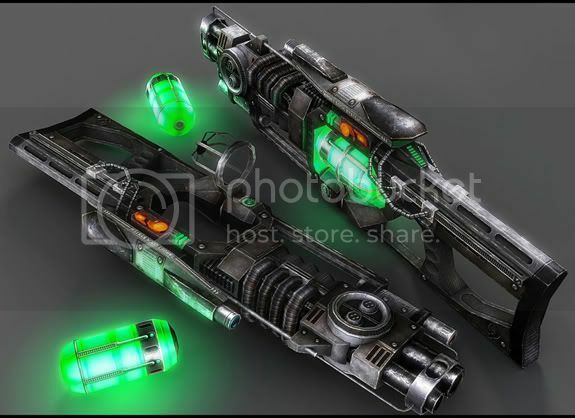 The Type III phaser employs an active recharge system, allowing energy from the phaser beam to be cycled back into the phasers energy system allowing it to maintain a near indefinite charge life when discharging at or bellow level 8. The Type III Phaser Rifle has no effect on any Cardassian Centurion Model. 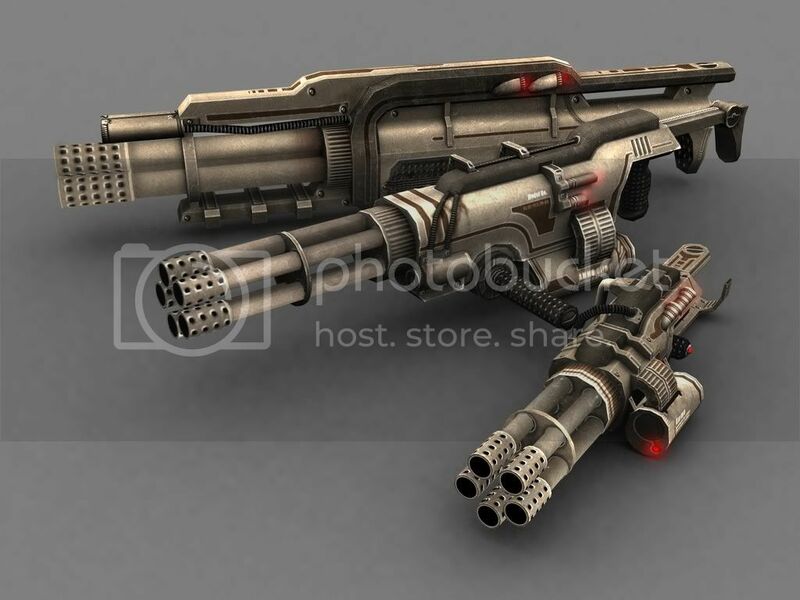 The Type I Heavy Phaser Rifle also known as the Type 3A was designed to deliver greater power then the Type III Phaser Rifle. The 3A has a far higher discharge power as well as a greater fire rate then its predecessor. The 3A is issued to some federation star ships, and is employed by security forces when dealing with high risk situations as well as being issued to landing parties entering a combat zone. In order to increase power output the Type I Heavy Phaser Rifle lacks the active recharge system employed on the Types II and III. This restricts the weapon to a finite number of discharges, how ever allows for greater power discharges. The Type 3A has a limited effect on Cardassian Centurions with Model I armor packages when fired on its maximum setting. The Type II Heavy Phaser Rifle was designed during the Borg War to more effectively combat Borg Drones. The Type II Phaser Rifle, while externally identical to the 3A unit, delivers greater power, and is self modulating. 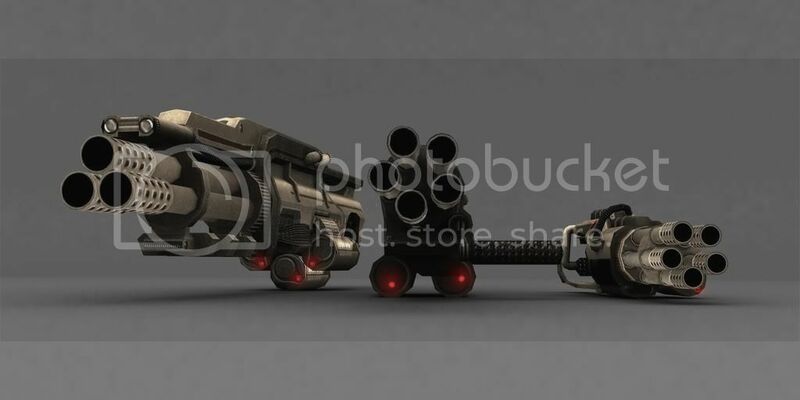 The Type II Heavy Phaser Rifle is other wise known as the 3B unit, and is equipped with a new active recharge system known as an autonomous recharge system or ARS. 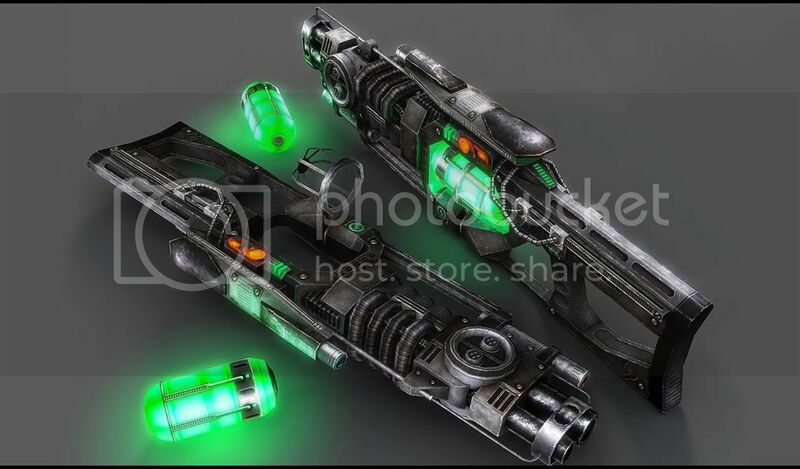 The ARS functions only when the weapons power cell drops bellow 10%, extending fire life by nearly 30 hours. The ARS draws less power from the rifle then pervious recharging units, and can be deactivated if additional fire power is needed. The 3B is slowly phasing out the 3A, and can be used against Cardassian Centurions equipped with Model II armor packages on its maximum setting. The 3B has also been modified to operate with in a vacuum. The Advanced Compression Rifle was made to phase-out the first production Compression Rifles. 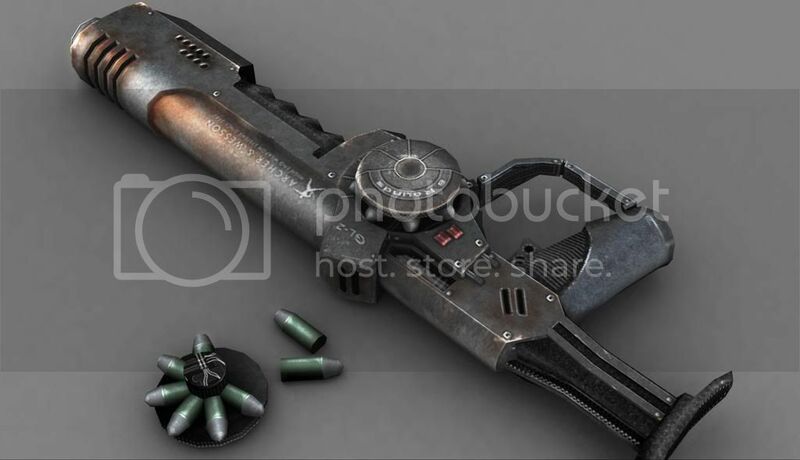 The compression phaser rifle was in service in the early 2370s. When the Dominion threat became urgent in late 2370, Starfleet decided to issue its forces with a new class of heavy rifles to increase the firepower available to them. The Modern Phaser Rifle project would evaluate two competing designs, the Heavy phaser rifle and the Compression phaser rifle. Both would be rushed into service as fast as possible. Despite the initial failure of the compression rifle Star fleet later saw fit to pursue the technology again during the Borg War with greater success. The new version of the Compression Rifle employed an advanced cooling system allowing the weapon to discharge extremely rapidly. The ACRs are currently deployed through out most of the fleet, and are used to compliment the Type II Heavy Phaser Rifle, providing cover fire in dangerous situations. The ACR is less powerful, but more durable then the 3B model, and is meant to serve in greater number as an anti-personnel weapon rather then to be used against armored embankments. The ACR is not effective against any Cardassian Centurion models. The XM8 is deployed through out the federation for use in situations where normal Phaser weapons are inoperable. The MX8 is made of a carbon composite material making it both extremely light weighing in at only 5.7 pounds as well as enormously durable. The MX8 is a versatile weapon, and can be quickly altered to fit the needs of any combat condition. 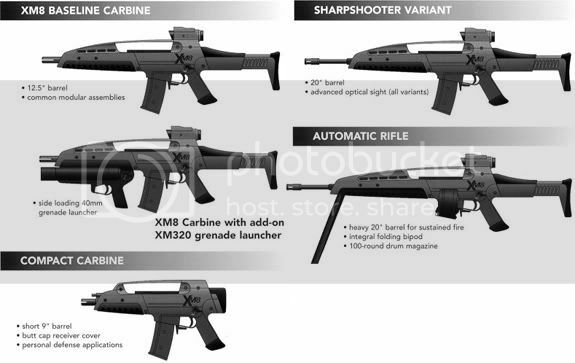 The MX8 can be equipped with a grenade launcher, and can fire the type III light photon, or Type V frag grenades. The MX8 can be used against all varieties of targets at nearly any distance. The MX8 is effective against all Cardassian Centurion models with explosive rounds, or in basic carbine mode when used in tandem with Photon grenades. The Federation Fusion Rifle was developed directly to combat the Cardassian Centurion. Designed in 2407 the Fusion rifle was in use on all federation vessels by 2411. The Fusion rifle can destroy a heavily armored centurion unit from 25 meters, and can damage a unit from as far as 50 meters. The Rifle fires a directed particle beam which slowly degrades as it travels. The fusion rifles is extremely bulky, and as such is generally used by the marine detachments onboard a star ship. Each clip contains enough reactant to fire 75 rounds. The fusion rifle is effective against armored target, and has limited functionality as an anti armored vehicle weapon. One major fall back of the weapons design is that it takes nearly two seconds to charge when first fired, how ever when fired multiple times the charge time drops considerably. 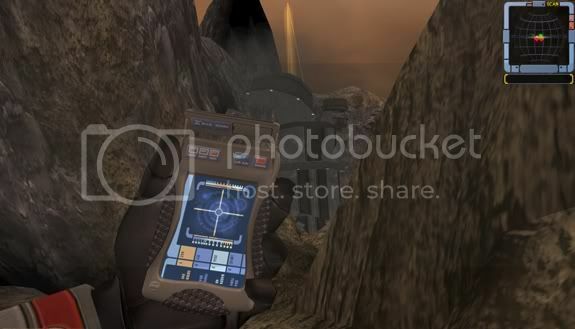 This program has been installed into every tricorder excluding medical tricoders and can be accessed by any crew member while on an away team; virtually anywhere as long as the ship the tricorder is assigned to is within range. However, even though any user can access it, the program requires the Commanding Officer's, Executive Officer's, or Chief Tactical Officer's approval. This allows an away team to paint a target and fire the ship's weapons at a specific target. The CO, XO, and CTO can override the protocol that requires authorization from those three officers. Draw backs include blast radius; anyone within 20 meters of the painted target will most surely be killed or critically injured. The ship's weapons do not fire immediately after painting a target, it takes about 4 seconds varying on the situation for the weapons to fire and reach the target. Very useful when taking out large targets and when a ship's tactical sensors can not pinpoint specific targets. The Hammer of dawn can only function if the assigned vessel is with in range of the phaser system, there is an open sky, the weapons systems are charged, and the target is slow moving or stationary. The Hammer of Dawn can also be used to coordinate fire with heavy air support. In this case the Hammer paints a large truck for destruction. The Truck is moving too fast to coordinate fire with orbital weapons, but a lighter shuttle craft still has enough power to do the job. The Hammer of dawn can also be used to target enemy soldiers to be attacked by gun boats or other support craft. 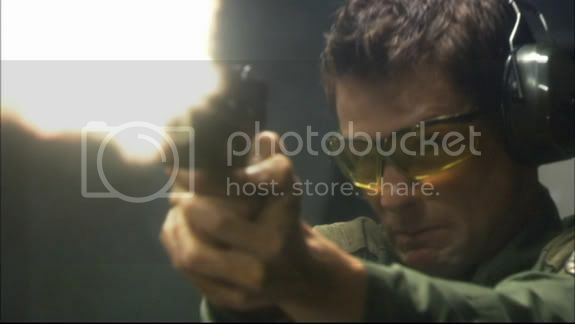 The Tactical 12 Gauge is the federation light shotgun and is standard on all federation vessels. 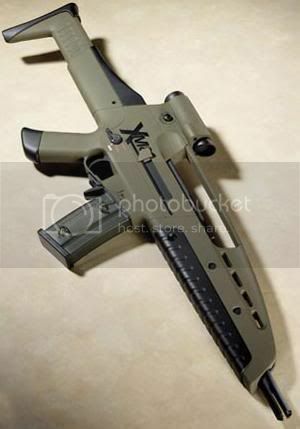 The Tactical 12 Gauge is capable of firing both shot, and explosive rounds. The Tactical 12 Gauge holds up to 6 rounds in a clip which can be quickly ejected and replaced allowing for a small reload time. The Tactical 12 Gauge is chiefly an anti personnel melee weapon, how ever when using explosive rounds it can be effective at medium and long range. When equipped with shot based projectiles the size of the shot can be varied depending on the threat presented, and the amount of force need. Generally when using shot projectiles the operator carries multiple clips with multiple size shot rounds in order to be able to quickly change the amount of force involved. When firing shot the Tactical 12 Gauge is primarily used to support other weapons at close range or help defend sniping positions. When less then lethal force is required rubber or �soft� projectiles can be used, which will bring unruly targets to the ground with out mortally wounding them. The Tactical 12 Gauge is effective against all Cardassian Centurion models when equipped with explosive rounds. The Federation Uses the Compact Grenade launcher to provide heavy support for units engaged in combat activity. 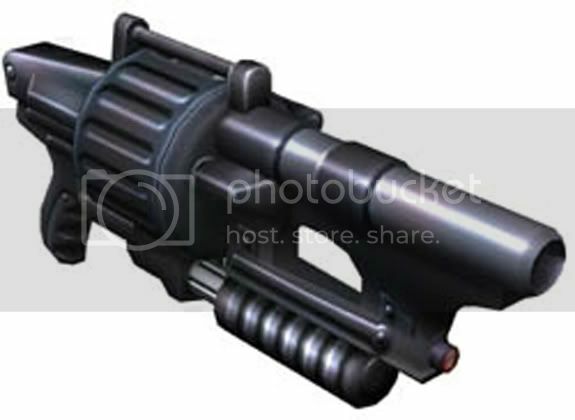 The Compound Grenade Launcher, other wise known as the CGL is used through out the federation by marine and security units as well as by landing parties. The Grenade launcher is capable of firing the type III photon grenade, the same grenades used by the MX8. The Launcher has an effective range of over 700 meters, allowing the grenades to be launched over defensive embankments. The CGL is effective against all Cardassian Centurion units. The Type III Photon Grenade is an improvement on the type II design. The Type III is more compact then the Type II and has more power on it�s maximum setting. The Type III Grenade can be both hand thrown as well as being fired from all federation grenade launchers. The Type III has a variable yield configuration, ranging from moderate stun to heavy disruption. 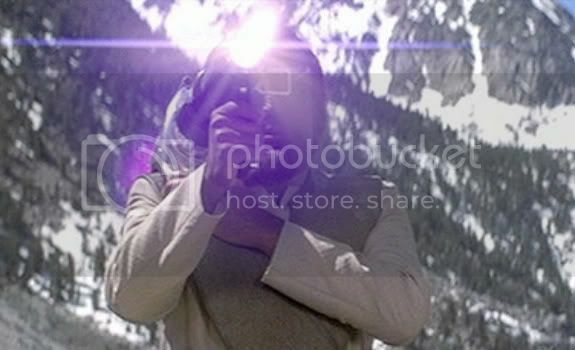 Level 1 Visible Flash: Emits a bright burst of light along the visible spectrum, as well as creating a high decibel explosion. This setting is meant to disorient opponents for up to 30 seconds. Level 2 Smoke: On this setting the Grenade will create a large amount of smoke hampering visible as well as sensor systems with in the affected zone. Level 3 Heavy Stun: The Grenade detonation creates a similar effect to being hit by a phaser on high stun, leaving targets with in a 20 m radius unconscious for up to 20 hours with mild burns. Level 4 Frag: The Grenade detonates, sending solid projectiles in all directions meant to inflict severe abrasions, often resulting in internal injury. Frag is the lowest setting which will have any effect on a cardassian centurion. Level 5 Low Disruption: Low Disruption is the maximum safe rated setting for use with in a Federation Star ship. Low Disruption is able to effectively neutralize any Centurion model. Level 6 Disruption: On this setting the Grenade will detonate an antimatter charge neutralizing everything with in a 40 meter radius. Level 7 Heavy Disruption: Warning! 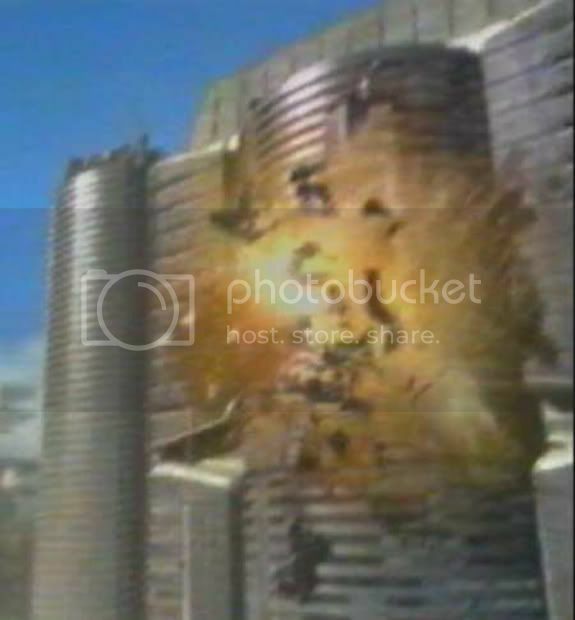 Do not use setting seven when not using a launcher On Heavy Disruption everything with in a 100 meter radius will be neutralized using an anti matter detonation. 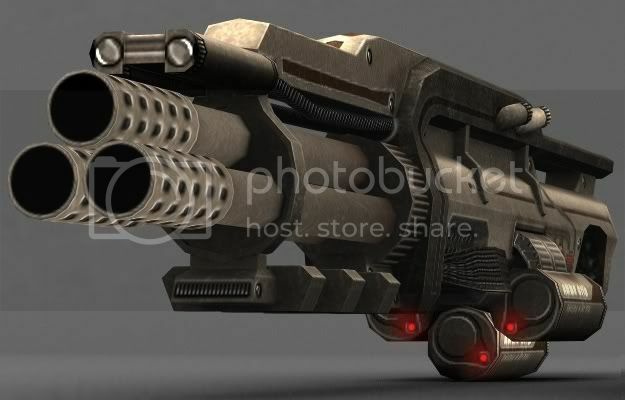 The Isomagnetic Disintegrator is the standard heavy infantry energy weapon in use through out the federation. The Isomagnetic Disintegrator was in use as early as 2375, and was employed with a fair amount of success during the Borg War. The Isomagnetic Disintegrator fires pulses rather then continues beams which react violently upon contact foreign objects. The weapon employs a comparable charge system to the Type III phaser rifle, how ever the larger storage matrix allows the weapon to discharge with far greater destructive potential then its smaller counterparts. Like most federation phaser weapons the Isomagnetic Disintegrator requires very little training to operate. The key fault of the Isomagnetic Disintegrator is it�s inability to operate in harsh environment. In harsh EM environments the Isomagnetic Disintegrator is often rendered useless, or at least severely hampered. The Federation has attempted to overcome this short coming, but an easily applicable solution has never presented itself. The Isomagnetic Disintegrator is extremely effective against Cardassian Centurions with Model III armor or bellow. Developed during the dominion war, the Stun Baton provides a less then lethal short range defensive weapon for marines and security personnel. Developed by Starfleet in reaction to the increased need for marines operating in and around densely populated areas to quickly and safely bring potentially violent situations under control. First entering into wide scale us during the Borg war to maintain order during large scale evacuations as a prelude to an anticipated Borg assault, relatively little has changed since the weapon was first introduced. The Stun Baton uses photonic energy to incapacitate the assailant at 3 separate settings. The Stun Baton makes use of the ARS system and at its lowest level can retain an almost unlimited charge. The Standard Issue 45 caliber Pistol is the federation issue side arm for combat tours. 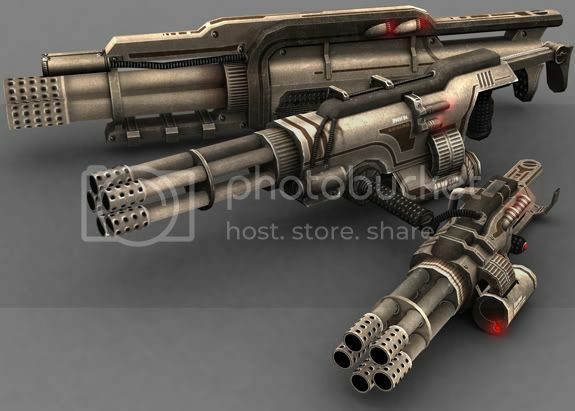 Starting in 2406 these weapons were issued on a limited basis to combat zones to provide a rapid fire light weapon with significant stopping power. The SIP 45 proved to be a versatile killing machine with enough power to stop a centurion with two well placed rounds. In light of the weapons performance the federation issued an order to Browning weapons for a full production run of the weapon. The SIP 45 has a 15 round clip capable of holding less then lethal, standard, explosive, and incendiary rounds making it an asset in any situation. In addition the SIP 45 is equipped with a bellow barrel explosive launcher holding a single round. The SIP 45 is capable of firing in both semi automatic and burst fire mode, and can completely discharge in under 10 seconds on semi automatic. Burst fire mode fires three bullets in rapid succession automatically, how ever this function can not be employed when using explosive or incendiary rounds. The SIP 45 uses a high power kinetic reload system to eject spend rounds and replace them extremely rapidly. Clips can be ejected and reloaded in rapid succession allowing for sustained fire. 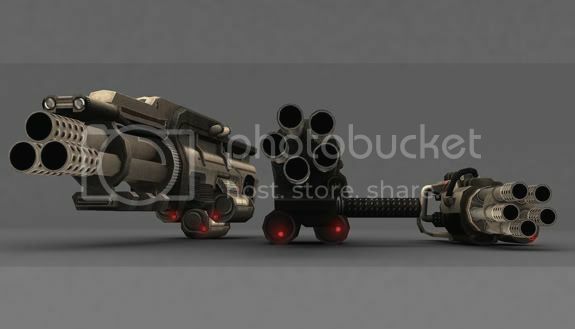 The Quantum Burst Cannon is distributed to Vessels with large Marine units, or to those vessels deploying ground troops into a combat zone. The Quantum Burst Cannon fires miniaturized quantum torpedoes, and has two fire settings, low yield, and high yield. On both settings a visible spectrum laser is used to guide the torpedo to a predetermined target. The Quantum Burst Cannon has proven to be extremely effective against fixed ground instillations, APCs and as an anti air craft weapon. Because of the weapons low rate of fire, multiple Cannons are often grouped together, or supportive personnel equipped with light weapons are positioned to help defend the unit�s operator. Generally use of the Quantum Burst Cannon is restricted to marines, how ever if needed other personnel can quickly be trained in the units function. The Quantum Burst Cannon employs a Kinetic reload system, using the recoil of the last round fired to move a new round into the firing chamber. This is among several improvements made over the Photon burst cannon which employed a less advanced reload system. The Federation has employed the Quantum Burst Cannon through out both the Borg and Cardassian Wars with promising results. The Quantum Burst Cannon is effective against all Cardassian Centurion Models. 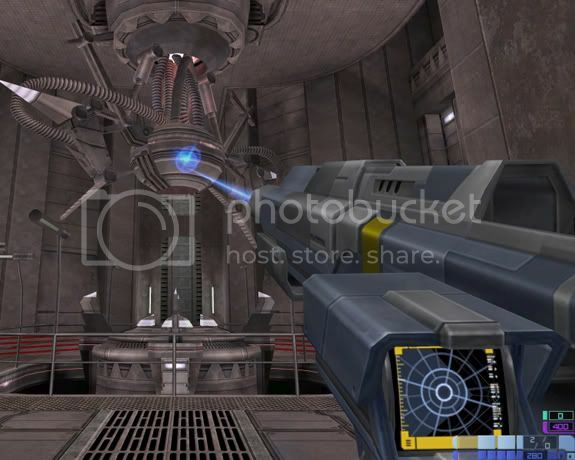 The Federation F8 Plasma Rifle is an extremely powerful weapon deployed on federation Vessels with large marine compliments or those vessels deploying ground troupes to a combat zone. Special certifications are required to operate the weapon. The F8 has large clips which hold only 10 rounds. Each round has a 2 meter splash zone, inflicting massive thermal damage, and can destroy almost anything the super heated plasma contacts. The F8 is effective over a 20 meter range, past that the energy of the round decreases exponentially, how ever the round remains dangerous for up to 40 meters. The F8 has a fairly rapid fire rate for a weapon its size, and clips are designed to be replaced quickly for sustained fire. The F8 is effective against all Cardassian Centurion Models. 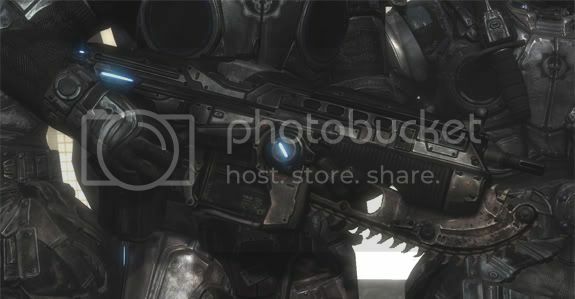 The Lancer Assault Rifle is the heavy automatic rifle used by the federation. The Lancer is in limited service, and is only used in heavy combat by marine forces. 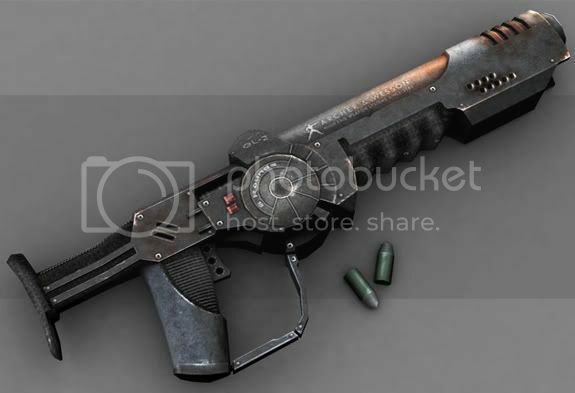 The Lancer was designed to compliment the fire power of the Gnasher. The Lancer was less prominent then heavy phaser weapons during the Dominion war, and did not see much action until the Borg War. Because the Lancer fired projectile weapons, the Borg were un able to adapt to the weapon, and it proved extremely effective. The Lancer was redesigned in the lead in to the Cardassian war to be rendered more effective against the Cardassian Centurions. The Lancer is used only in combat zones, and requires special certification for operation. While not as versatile as the XM8, the lancer was not designed to be a rounded weapon, but rather meet the need for an extremely high powered Tactical Assault Rifle. 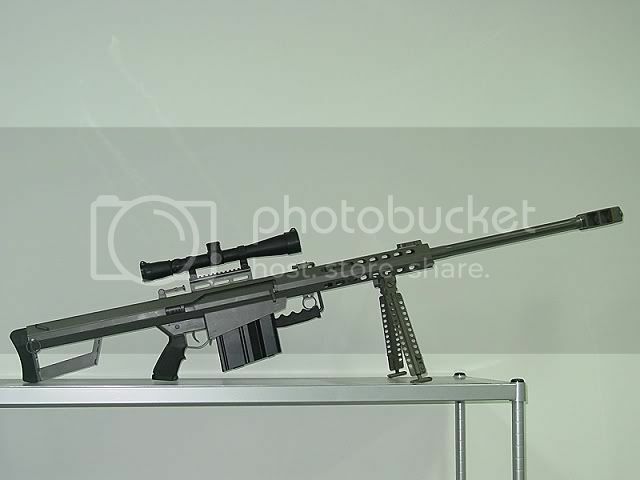 The Lancer is a fully automatic rifle, which can fire Both Armor piercing and explosive rounds. The Lancers Clip holds up to 60 rounds at a time, and the weapon can discharge at up to 15 rounds per second, and has a very high muzzle velocity. Exact caliber and muzzle velocity specifications remain a federation secret, how ever with only minor modifications, which can easily be made in the field, the lancer can fire the rounds used by the XM8 or rounds scavenged from fallen centurions. Even with the lighter callibur rounds the Lancer, with it�s longer barrel, has vastly superior stopping power. A Lancer can disable a Cardassian Centurion with any armor pack with a single well placed round. Perhaps the most easily recognized feature of the Lancer Tactical Assault Rifle is the Chainsaw Bayonet. When the Lancer was introduced during the dominion war the Bayonet was designed to act as a physiological deterrent. It was loud, fast, and extremely dangerous, and in many ways succeeded in deterring Cardassians from attacking Federation marine instillations. When the Lancer was upgraded for service in the Cardassian War the Chainsaw bayonet was not neglected. Rather the intimidating component was expanded. The top RPM speed of the saw was increased to 500 RPM, and the noisy chemical fired engine was replaced with a high speed high torque Electric motor fed off a battery pack in the weapons magazine. This change greatly reduced the rev time allowing the chainsaw bayonet to be used more rapidly. The Saw itself was retooled, and was fitted with diamond tipped teeth, allowing it to be used to cut through light armor. The Chainsaw Bayonnet can be used to decapitate Cardassian Centurions fitted with type III armor packages or bellow. With its awesome stopping power, and rapid rate of fire the Lancer is one of the federation�s most dangerous projectile weapons. The Intimidator was developed during the Borg War to provide heavy fire support while evacuating civilians. The Intimidator was based off the less successful FRF-12, and DU-32, both of which lacked the intimidators stopping power. The Intimidators is only deployed to hot zones, as it has no less then lethal fire settings. 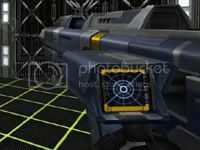 The Intimidator fires high velocity armor piercing explosive rounds and is the only projectile weapon with a built in phaser system, visible just about the rotating stock of the weapon. 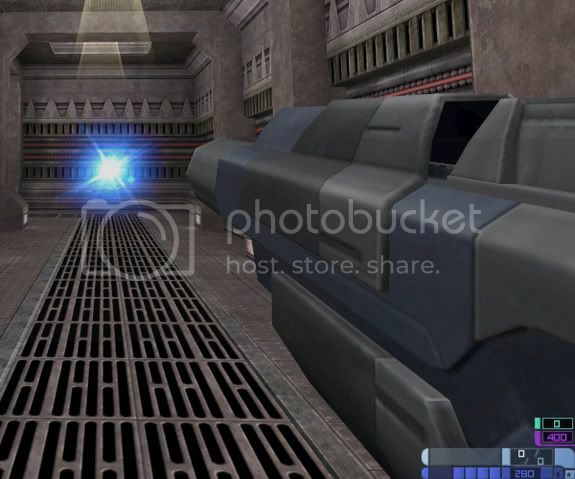 The Phaser system fires two wide angle beams taking out hostiles in close proximity to the shooter, allowing the Intimidator to operate almost independently of supporting fire. The Intimidator can be equipped with a tripod for stationary defensive operations, and can then be fitted with an 80 mm grenade launcher fitted bellow the weapons stock. In addition to three Amo storage drums holding up to 3000 rounds each the Intimidator has an ammunition Reclamation system, allowing the weapon to actively replicate ammunition as the gun is being fired. While this function lags slightly behind the fire rate of the gun, the enormous capacity of the weapon insures that no soldier will be stranded with out ammunition. 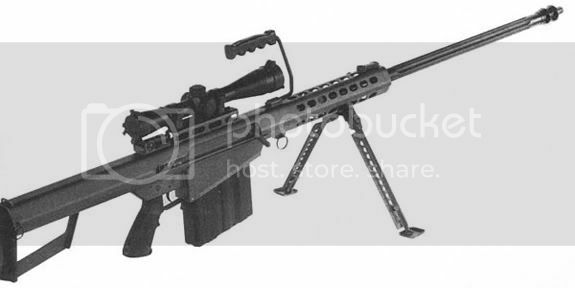 Because of the rapid fire rate of the Intimidator, nearly 300 rounds per minute, tremendous amounts of body strength is required to operate this weapon with out the use of a tripod. Use of the HGW is restricted to marine or combat certified personnel, and requires extensive training to be used properly and prevent overheating. The Intimidator is often fitted to armored vehicles or gun boats to provide additional cover fire in combat zones. The Gnasher is in limited service, and is only used in heavy combat by marine forces. The Gnasher was deployed during the dominion war to front line shock troops who used the weapon in close combat with Jem Hadar soldiars. The Jem Hadar came to fear and loath the Gnasher, and it was considered a valuable prize when taken in battle. The Gnasher remained in use through out the Borg war, used to fend off hordes of Borg drones. 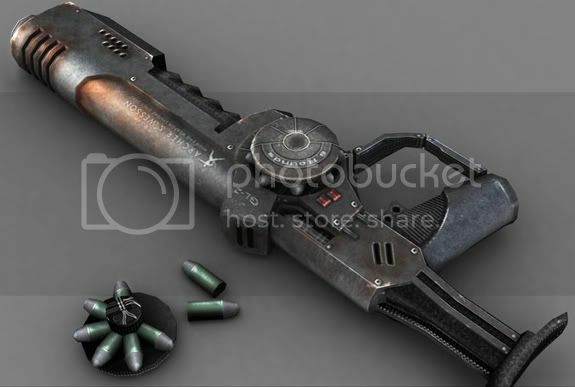 The Gnasher was modified in the lead in to the Cardassian war to be more effective against Cardassian Centurions, how ever the Gnasher is still considered to be one of the most brutal anti personnel weapons ever to be constructed by the Federation. The Gnasher is designed to fire two types of rounds. Primary fire utilizes the upper barrel, and fires a cluster of explosive pellet. 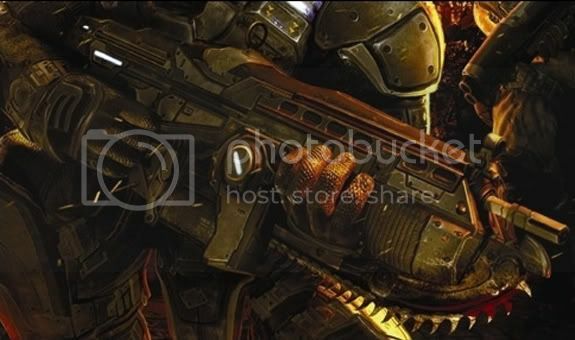 The Gnasher�s secondary fire mode was created in the lead up to the Cardassian war, and consists of an extreamly powerful armor piercing EMP Round. 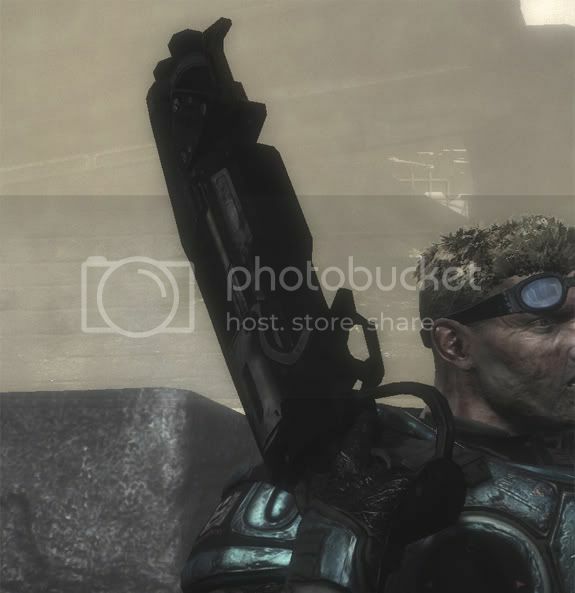 Each Gnasher Magazine holds 20 rounds, and can be partitioned to allow the user to favor one type of round over the other. The explosive pellet rounds leave the Gnasher at extremely high speed, and like shot remain clustered together, designed to pierce skin, as well as light armor. Once the pellets enter the target they explode, causing massive internal injury. The EMP round is designed to take out computer function with in a limited area. This round was initially designed for use against the Borg, how ever, with the advent of the Cardassian war, the round was modified for use against the Cardassian Centurion. 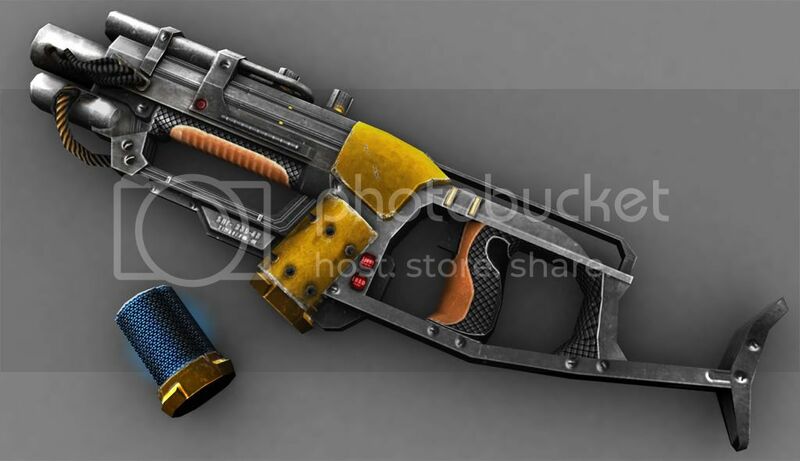 Because the Gnasher holds a limited amount of ammunition and is designed for close range combat, Star Fleet saw necessary to reinforce the barrel as well as add a protruding pick at the end of the weapon to make it more effective in melee combat. The Unique weight distribution of the weapon allows it to shatter the skulls of most hostiles with a good swing. The RS-21 is an old, but reliable missile launcher. First used in the Dominion war the RAM Shot is a very effective and reliable weapon. Despite its size the launcher weighs only 10 pounds when loaded. The RS-21 employs an optical sighting system which can be used to obtain targets, and then establish a target lock. The RS-21 can fire a variety of rocks, and is effective against a wide array of targets. 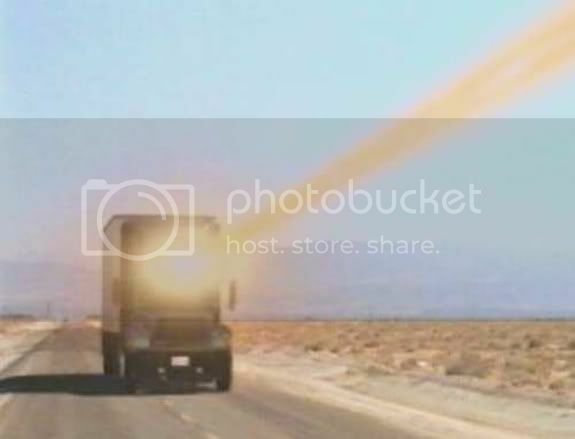 Among the Rounds fired by the RS-21 are the anti armor and long range missiles, which use uniquely configured anti-matter charges to destroy their designated targets. The most common round used in the RS-21 is the Anti-Armor Missile, which can penetrate up to 33 CM of high density armor prior to detonation with an effective range of nearly two kilometers. The Long Range Missile used by the RS-21 can establish a target lock on an object nearly 3 KM away, and can be used by forces on the ground to defend against aerial attacks. The RS-21 employs a unique chambering system allowing multiple missiles to be stored in a clip. Missiles are fed from the Rear chamber of the weapon into the forward firing chamber. A mechanical valve then seals the forward chamber, preventing the propellant from entering the rear magazine. When firing Anti-Armor Missiles, up to three missiles can be loaded into the aft chamber of the RS-21. The projectiles can then be fired in rapid succession. Once the clip has been depleted it can simply be unscrewed from the forward unit, and replaced with a new clip. When firing Long Range Missiles only one missile can be stored in the clip at a time. 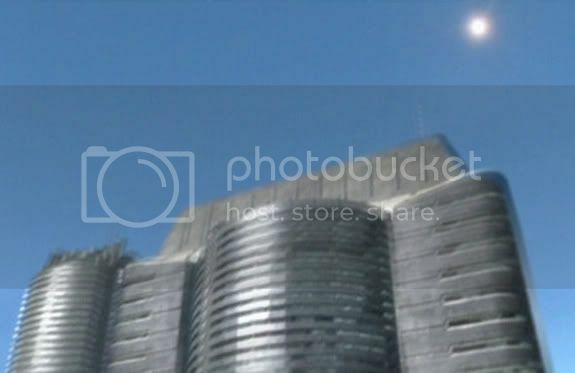 Additional batteries to provided power for the launcher unit are contained in the RS-21�s clip, and while the forward launcher does have an independent power source, how ever there is some limit to the RS-21�s function with out the aft clip. The Forward launcher can be used with out the aft clip, but then it must be manually reloaded each time a missile is fired, and the automated sighting system can only be used for up to three rounds before its power system must be recharged, or the unit will need to be fired via manual targeting with out a target lock. During the lead up to the Cardassian war two additional rounds were developed for use with the Ram Shot Platform. The RS-21 can now fire an antipersonnel variant of the Long Range Missile, which is designed to be effective against armored and centurion units. The Antipersonnel missile has met with great success in field applications of the round. The Ram shot can also fire a small EMP generator, which disrupts all computer function in a given area. These rounds are extremely effective against Cardassian Centurions, how ever they are still in the primary stages of deployment, and several marine officers have called the reliability of the round into question in less the favorable conditions. The MGL-4 was designed in the beginning of the Cardassian war to give Federation troops the means to destroy large numbers of Centurions. It has a 12 round drum allowing the soldier to fire off multiple grenades in rapid succession. The MGX-4 was designed to fire the latest federation fragmentation grenades, the Type V. The MGL-4 can also be used as a launching platform for small reconnaissance drones. The effective range of the weapon is 400 meters for launching Fragmentation Grenades. 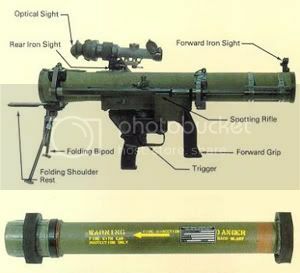 The MGL-4 is also equipped with smart Grenade settings, allowing it to modify the time or position at which detonation of the round will occur, which uses the laser sighting system to determine the kinetic force needed to breach a defensive position, as well as how to properly set the round. The MGL-4 has only recently completed the experimental stages and as such is only available on a mission specific basis or on dedicated warships. The Type V Fragmentation Grenade was designed during the Borg war to be used against large numbers of drones to assist in combat operations. Unlike the Federation photon Grenade, the Fragmentation Grenade does not have any variable settings; once the weapon is released it will detonate sending large amounts of shrapnel into the surrounding area, and is extremely lethal to any ground units in the immediate area. There are two variations of the Type V Fragmentation Grenade, the first is the hand thrown unit which has a large handle extending from the end of the Grenade leading to a large pin, the second is nearly identical to the first except it lacks the Handle. The first variant is designed to be used by marines in the field, removing the pin activates a timer in the Grenade which is then physically lobbed at an enemy position. The second Variant is designed to be used by the MGL-4, and works in the same way as the first variants, expect it can not be thrown by hand. It detonates either at a predetermined altitude, or upon impact. 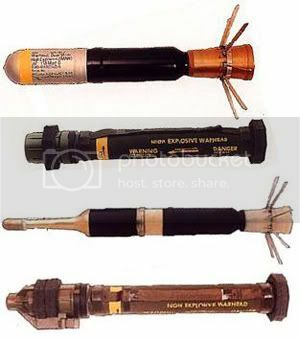 The MGL-4 variant can be modified for �smart� operations, where it detonates after penetrating through a window or wall. This is done through the control interface on the MGL-4, and can not be preformed with the thrown variant of the Mark V.
M-82 is the newest Federation sniper rifle developed during the lead up to the Cardassian War. It is a semi-automatic projectile based weapon, with a built in silencer to increase its operational stealth. In tests the M-82 proved much more successful than particle based sniper rifle for the simple reason that the glow from the phaser shot gave away the sniper�s position. 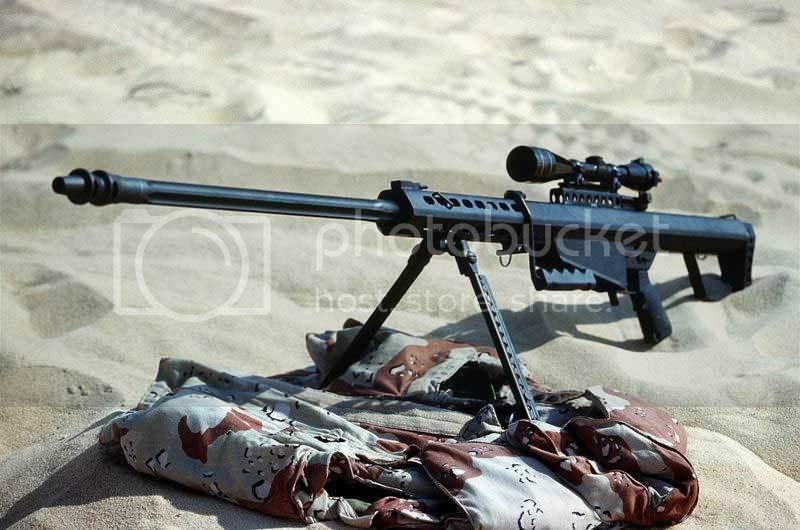 In tests, a sniper with the M-82 managed to get fifteen kills before being spotted. The M-82 was designed to fire in any situation, and in any weather condition. Special attention was given to preventing jamming of the various internal components, as well as insuring the durability of the rifles protective shell. The 10 round Box Magazine fitted to the bottom of the rifle was designed to take tremendous abuse with out failing. In lab tests magazines were filled with cakes of mud and other materials soldiers might encounter in the field, allowed to dry, and then test fired. The M-82 is an extremely powerful, extremely deadly weapon. Despite the limitations of projectile rounds, the M-82 more the compensates for its short comings with an effective range of over 1,500 meters, and a built in targeting system designed to assist in acquiring, and tracking targets. The M-82 is also far stealthier then conventional phaser rifles, which reveal their positions when fired. The M-82 has virtually no muzzle flash, and is extremely quiet. The Box Magazine allows for fairly rapid firing for a sniper rifle. Exact specifications, such as caliber, muzzle velocity, exact effective range, and how the targeting systems work, are all classified by the federation. Despite its short service life thus far, the M-82 has established itself as a powerful weapon, and is available on most federation star ships for marine usage, how ever Starfleet recommends that extreme discretion be used when employing the M-82 for obvious reasons.